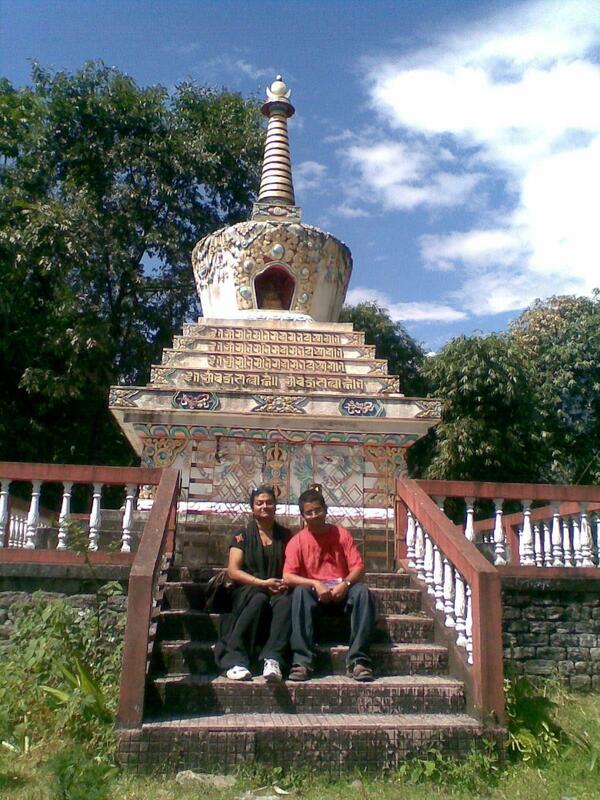 Since we (Mohua and I) could not go to Ajanta and Ellora - we planned to go to Sikkim as a stop gap. Obviously there is no train seat available. So we planned to go by bus. We got the ticket from Raha travels counter inside the main WBSTC Bus depot. Normally a ticket would cost you Rs 700/- per head if you book AC bus ticket. Otherwise it is Rs 350/- for Non AC bus. 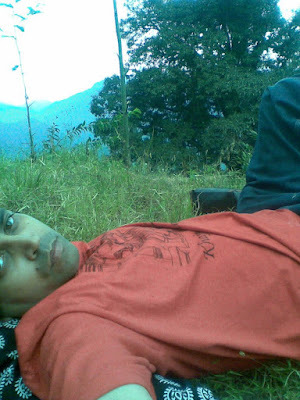 Normally bus fare for Volvo bus is around Rs 800 -950/-. Forr Volvo bus online booking is possible . Train fare(non AC) is however cheaper - around Rs 250. Our bus left from Esplanade Bus depot at around 8.10 p.m.
We reached reached Siliguri at 8.40 p.m. While I was travelling I was not sure where I will go in Sikkim. But after going through my book, in the bus, I have decided that it is better to go to West Sikkim - i.e. 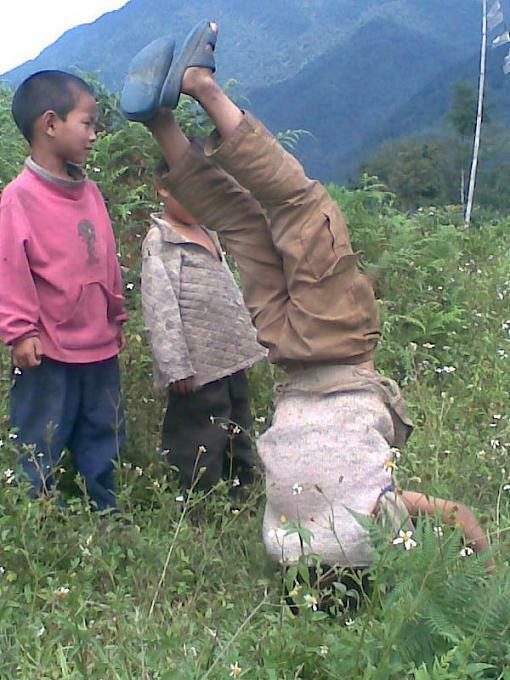 Pellling, Tashiding and Yuksom instead of going to Gangtok for the other main Zone of Sikkim (i.e. North Sikkim - for Yumtang) due to lack of time. North Sikkim being quite far from West Bengal will require more time to travel. There is a "separate" bus depot for Sikkim - SNT in Siliguri which is basically opposite Tenzing Norgay Bus Depot. 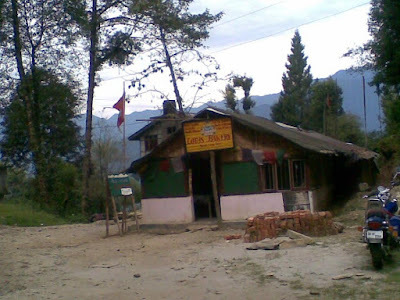 In fact the place where we got down (There is a booking counter for all the places of North Bengal and Sikkim) - the SNT Depot is basically 1.5 minutes walking distance. So I thought it is better to go there - since the competition will be more among the travel agents for the same route. In the mean time my friend from Siliguri called me to confirm this. 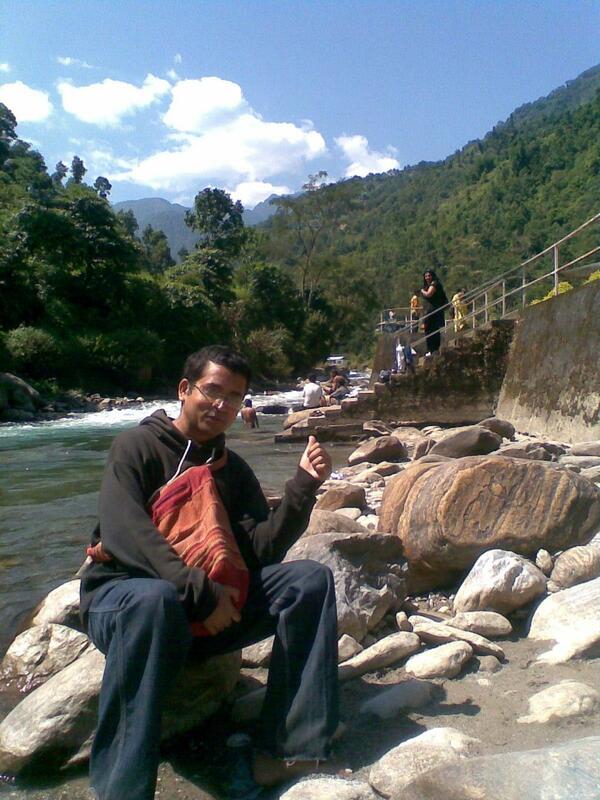 But unfortunately there is huge rush for Sikkim, since I am inside a long weekend. No bengali worth their salt will stay in their house and deprive them of a great holiday !! So what is the bottom line? There is no bus available.All are booked. So we came out of the SNT Depot to look for jeeps diagonally opposite the depots (In fact there are 2 jeep stands side by side) . The rates which are Rs 175 normally, they are asking Rs 400!! Even that is not available for a small group like us. Ultimately we got a jeep to go to Jorethang for Rs 250 per head. Anindya suggested that it is not a bad idea to halt at Jorethang since Hiley Varshey is nearby - which is a very nice place. We reached Jorethang after 3 hours journey. 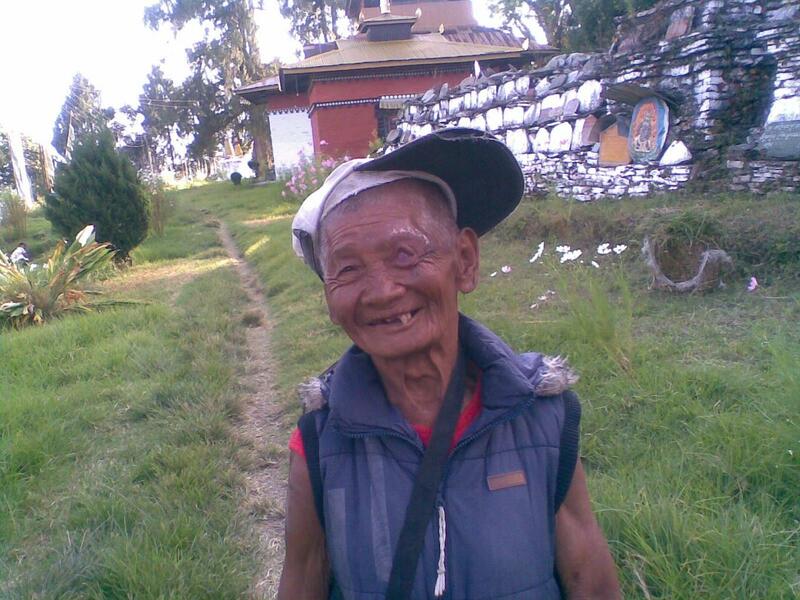 Jorethang was really hot. Mohua said there is no point going to a hilly place - which is so hot. It is a very big hill town. We were told there is hardly any bus available to go to Pelling. Just at that point of time we met a group of 4 people who were going to Pelling with a similar fate. And there was another group of 3 people with similar intentions! Immediately I was able to convince them that "we can travel together and just follow what I am doing". 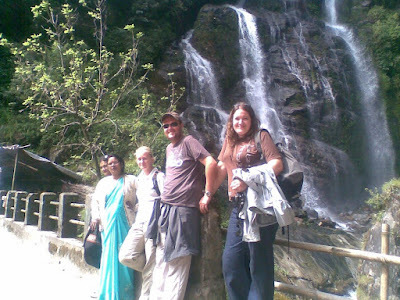 After they were convinced, I immediately hired a SUV- Tata Sumo for Rs 1200 and we started our journey to Pelling!!! It is an idyllic town 2,085 m above sea level; it offers breathtaking views of the snow-capped Kanchenjunga, the guardian deity of Sikkim. The hill sides draped in Alpine forests are swathed in swirling clouds and bounded by majestic mountains. 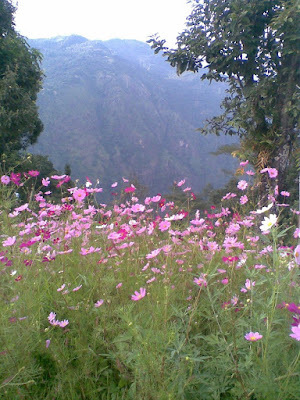 It is located 133 km from Siliguri and 125 km from Gangtok. The people are mainly of Nepali descent. Other ethnic groups include the Lepcha and Bhutia communities. Nepali is the most widely spoken language in the district. Among all the hotels I saw I found real value in Garuda and it was a classy hotel with a great dining room where you can sit and relax and have a glass of beer. Their cook is from Calcutta Red Hot chilli Pepper of Calcutta. So the Chinese food is quite good. The room charge was Rs. 400/-(since this is a season time) with a view. 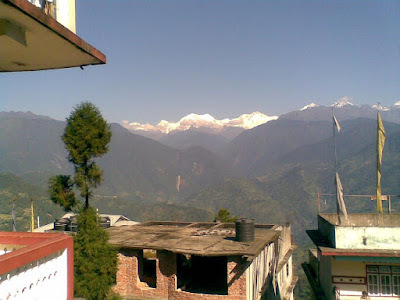 Main part of Pelling looks like a hair pain - one part is called lower and the other part is called upper Pelling. One of the group (group of 4) members of the jeep (out of four, two of them are working in HDFC Bank in Haldia ) are staying in a hotel (owner is known to them, booked them from Calcutta) in the Lower Pelling (we are staying in upper Pelling), which is slightly more expensive than our hotel (but without doubt not as classy as ours). 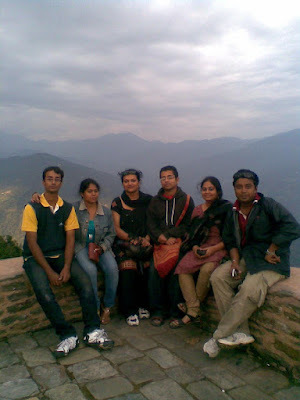 Next day we planned to make a day trip in Sikkim. Since they know the owner, it was easier for them to hire a jeep from the hotel for tomorrows city tour. In fact I impressed upon them it is economical for us - if we could travel together. More so, since they seemed to be a affable group. so Biswajeet called me to inform that they have almost booked a jeep from the hotel with the help of their friend. Being a seasoned customer, I told him that before you book, you should find out the rates from other agents outside their hotel to have an idea about the market rate. In the mean time I confirmed from my hotel that the rates are Rs 200 per day. So I went to their hotel to pay the money and talk to the travel agent. On reaching I got to know the rates are Rs 250 !! Any way next day we went for a city tour .We had an argument with the driver since they were not inclined to show all the places - they were supposed to show us, according to the chart displayed in front of the travel agents office. Ultimately we had to concede to them (However Biswajeet succeeded in paying lower [somewhat normal] the rates to Rs 225!). ( This was the second capital of the erstwhile kingdom of Sikkim after Yuksum and till the year 1814 A.D., the king of Sikkim had ruled the state from this place. The district was under the occupation of the Nepalese for many decades in the eighteenth and nineteenth centuries. 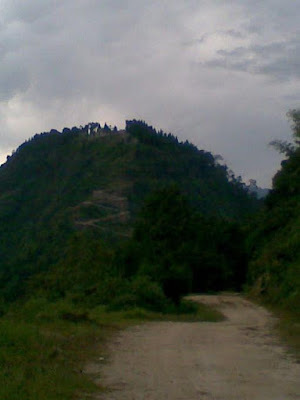 After the Gorkha War, the district was returned to Sikkim.Today, the ruins lie hidden from the main road at a walking distance from the Pemayangtse monastery. It can be approached by following a footpath which branches off the main road. The scenic view from the top of the ruin scanning across deep valley to the mystic heights of Khanchendzonga ranges is something to be cherished and etched in memory, although the ruins per se had very litte to offer.) 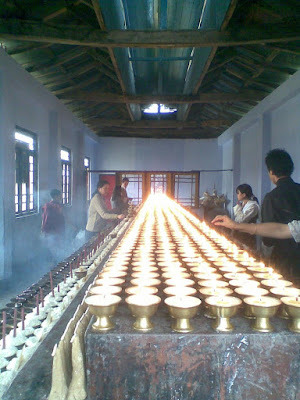 , Pemayangtse Monastery (Pemayangtse literally means 'Perfect Sublime Lotus'. 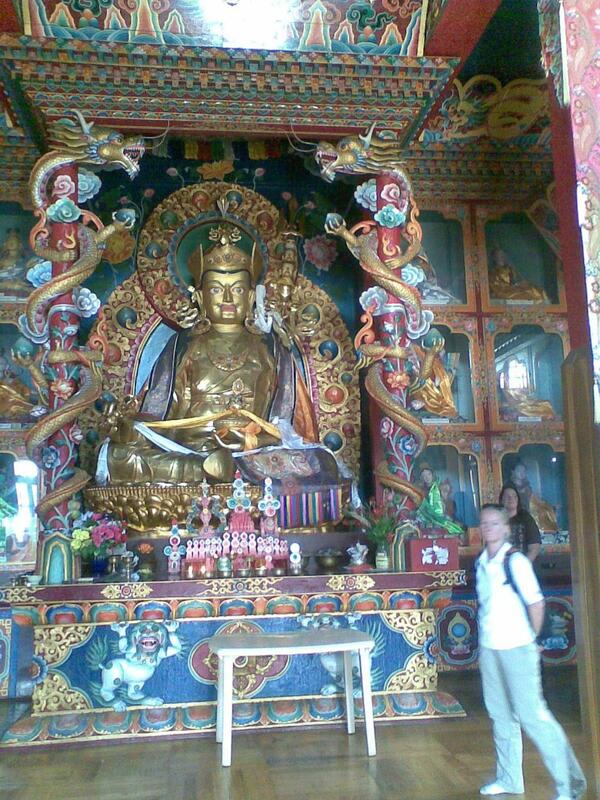 This is one of the oldest and most important monasteries of Sikkim. Founded in 1705, this monastery belongs to the Nyingma-pa sect. The three-storied building of the monastery houses a good collection of wall paintings and sculptures. On the third floor of the monastery, there is a seven-tiered painted wooden model of the abode of Guru Rimpoche, complete with rainbows, angels and the whole panoply of Buddha and bodhisattva. In January/ February every year, a religious dance called 'Cham' is performed in Pemayangtse) and helipad. We had momo near Katcheporie lake. After returning back to hotel we were planning to go to Yuksom and Tashiding by hiring a jeep , since there is no package tour for that. So we have to form a group. I met a nice Australian couple in our hotel , seating with Lonely Planet. I was also carrying LP. It appeared to me they were also planning a tour, which might coincide with our tour. So I told them about our plan - they agreed to join us. Biswajeet and his wife was not sure whether they will go to that place - they were thinking to go back to Calcutta to participate in the Lakshmi Puja. However the other two wanted to stay back. The main problem was their train ticket was not confirmed till that time and it could not be cancelled since it was booked by an agent (who left for Delhi keeping his mobile off!!) through Internet. They had an argument over that and ultimately none of them went for the tour. So we were again short of a full group. i informed Rose and Matt(Australian couple ) that our plan is off!! 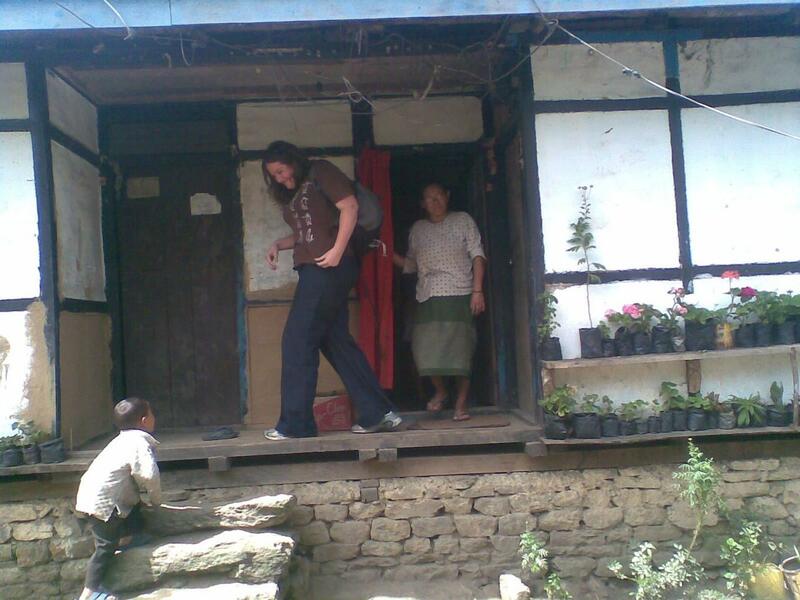 Next day we walked from Pelling to Pem Yangtse Monasatery - the walk towards the monastery was really pleasant. We had some pastries and patties from a bakery neat the entrance of monastery. After staying some time in the monastery, Rose and Matt went to see Rabdentse ruins (which we saw yesterday) . On the way back we had a brief stop over at Public works department bungalow. 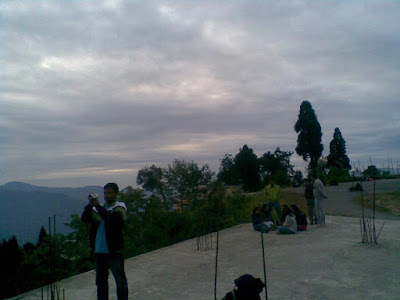 We went to the the second oldest monastery of Sikkim, Sanga-choeling Monastery - ridge above Pelling.To reach the Monastery one has to walk for 45-60-minute on steep hilly slope which lead through rich forests area - the route looks like a great wall of China from a distance. Unfortunately although we rested on the way, but still we could not make it to the top as Mohua felt exhausted. We returned our hotel. In the mean time Jola called us to inform that she will be joining us from Kolkata by evening. She lost her camera and mobile on the way. 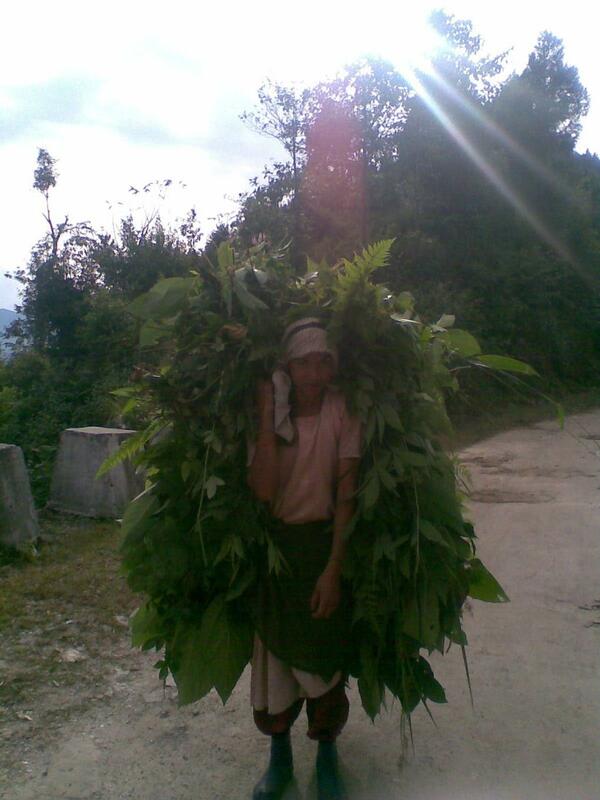 After she reached we informed the Police and we were told she left the camera at the check post to enter Sikkim. 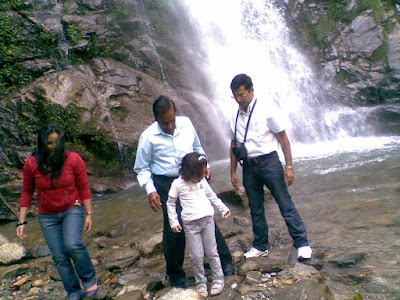 She was joined by Amrita (She is a Bengali from Bhadreswar, working in Bangalore) she has come to Sikkim for a short vacation to an unknown place! 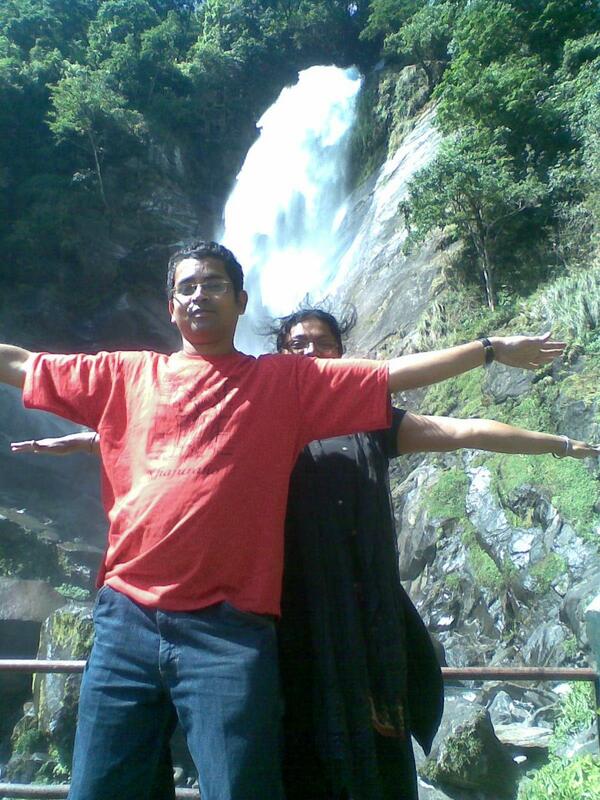 In the mean time I met a Bengali couple looking for a direction. Immediately I had a rapport with them and told them about our plan to go to Yuksom and Tashiding. They also agreed to make the tour since it will be economical for all of us. In the early morning we went to the helipad to see the sunrise. Next day we were joined by Jola, Pallabda and Mahuadi & Rose and Matt. to go to Yuksom and Tashiding. We saw Khangchendzonga falls and some other falls which we saw yesterday. 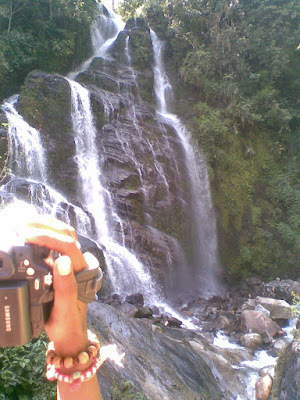 But the best falls of the place is undoubtedly Phamrong falls - from the condition of the staircase you can make out that not many tourists go there. First we went to Yuksom ( Yuksom,1780 mt, about 35 km from Pemayangtse, was the first capital of Sikkim. The real adventure begins from here, as it serves as the base camp for unforgettable treks into the wilds of the mountains since it is the last motorable point for the popular trek These high altitude alpine treks take you through fairy tale landscapes, dense Rhododendron forest to heights of about 12,800 ft. at Dzongri or to Goe Chala (via Dzongri) at a height of 18,000 ft. , awe inspiring Mount Khangchendzonga will be the accompany the trekkers during the journey. 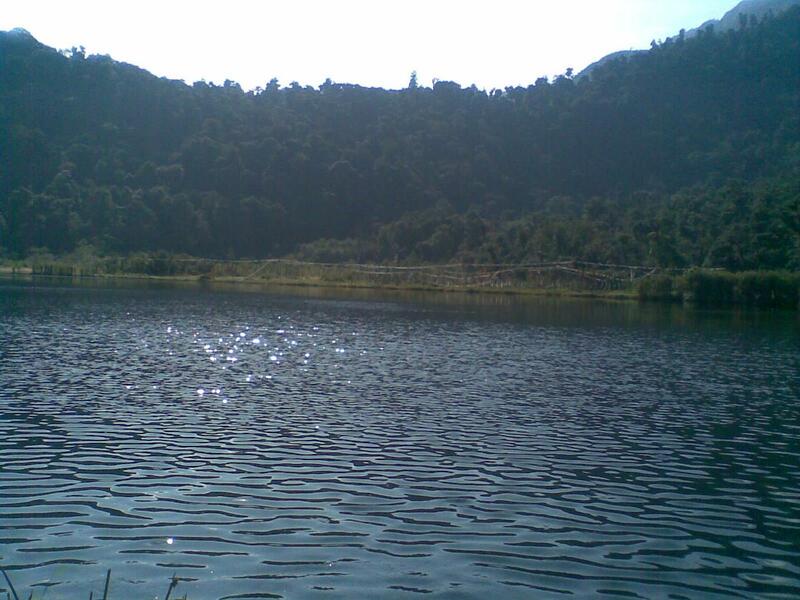 Khangchendzonga National Park in Yuksom is another place of attraction for wild-life animals and birds. It is the first capital of Sikkim where the first Chogyal of the kingdom of Sikkim was consecrated in 1641 AD by three learned Lamas. The Norbugang Chorten nearby still has the evidence of the consecration ceremony in the form of stone seats and a footprint of the head lama on a stone. 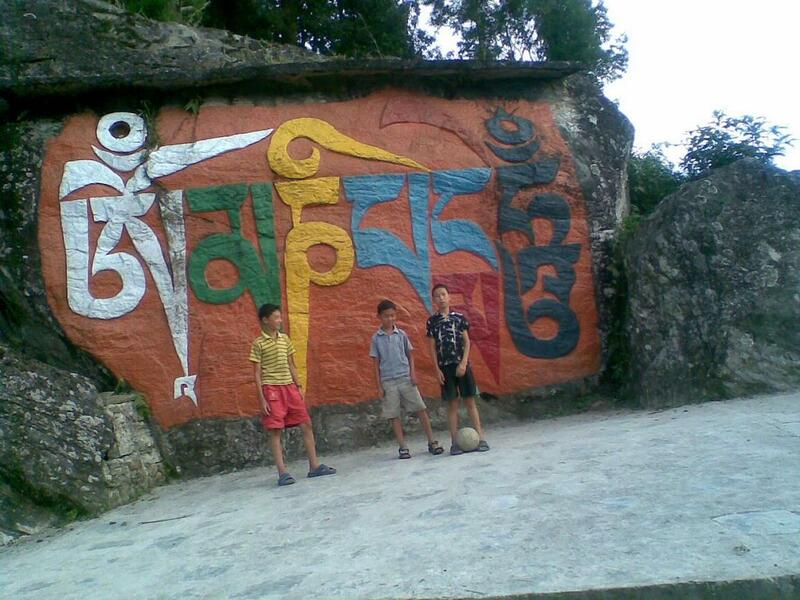 The name `Yuksom` means the meeting place of three Lamas. ). 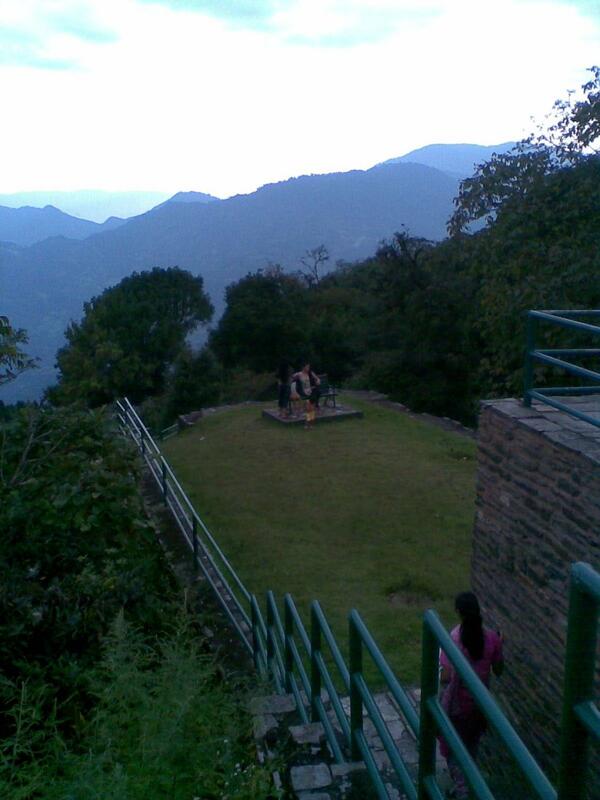 After that we trekked to a ridge just beside this place to see beautiful view of mountain ranges. We had some tea on the top. After some point Mohua stopped accompanying us since the road is too steep for her! She waited for us in the road. The we went to Tashiding. Tashiding Monastery lies at a distance of approximately 19 km to the south east of Yuksom. Perched on top of the hill rising between the Rathong River and the Rangit River, it provides breathtaking views of the scenery below. 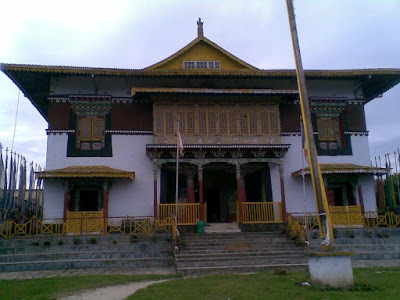 Tashiding Gompa of India dates back to the year 1717, which coincided with reign of the third Chogyal Chakdor Namgyal. 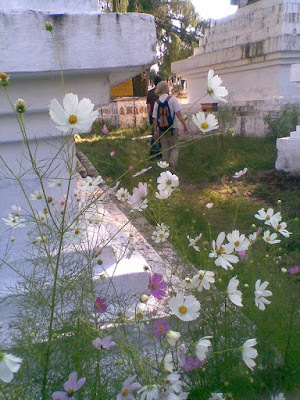 It is located on the site blessed by the great Guru Padma-sambhava. 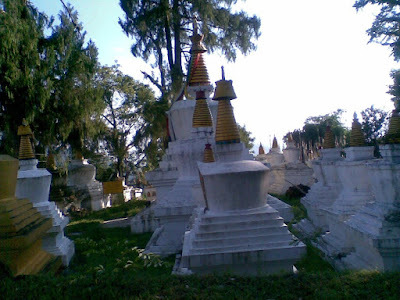 Built by Ngadak Sempa Chembo (one of the three wise men who consecrated ceremony of the first lama), Tashiding Monastery belongs to the Nyingmapa order. The main temple of the monastery was rebuilt some time back only. It stands encircled by traditional buildings, chortens and mani (stone plates).Mani stand inscribed with the sacred Buddhist inscriptions, like "Om Mane Padme Hum". The numerous stone plates is hallmark of the monastery and it is the work of the master craftsman, Yanchong Lodil. 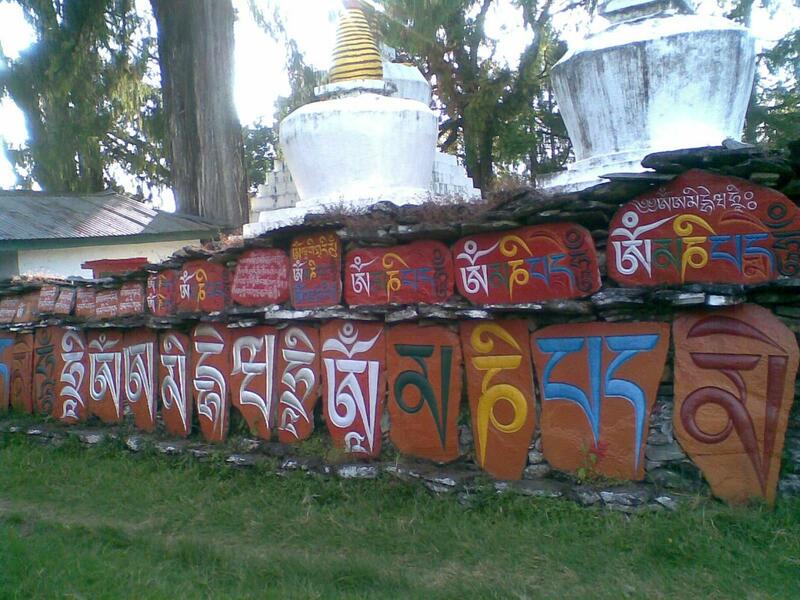 The chortens, preserving the relics of Sikkim Choygal and lamas, stand at the far end of the complex. After this we finsished our jorney and it was time to go back to hotel. The tour was really cheap and the cost was only Rs 2000 for the whole day - which is much chepaer than previous day's tour. On the way Mohuadi entertained us with Rabindra sangeet. Today all of us were suppose to trevel together to Siliguri. Although we were supposed to take different jeeps, I managed to swap the jeeps and we were clubbed in the same jeep!! Only Amrita had to sacrifice since I could not swap it (being one seat). 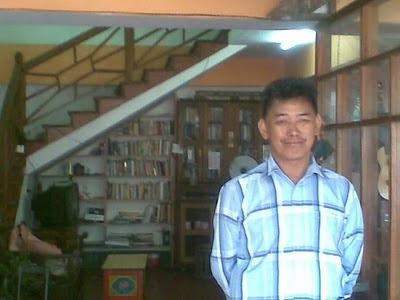 After reaching Siliguri Jola left for Darjeeling and all of us took some rest in Tukuda's house. Amrita,Pallabda.Matt and Rose had lunch (Biryani)near Tukuda's house (1 minute) . It was apparently quite good. Then we left for Calcutta in two different buses. Matt purchased the bus ticket from Darjeeling. Anindya somehow managed to get the bus tickets for all of us ( including Pallabda,Mohuadi and Amrita) although there was huge rush, through his friend!